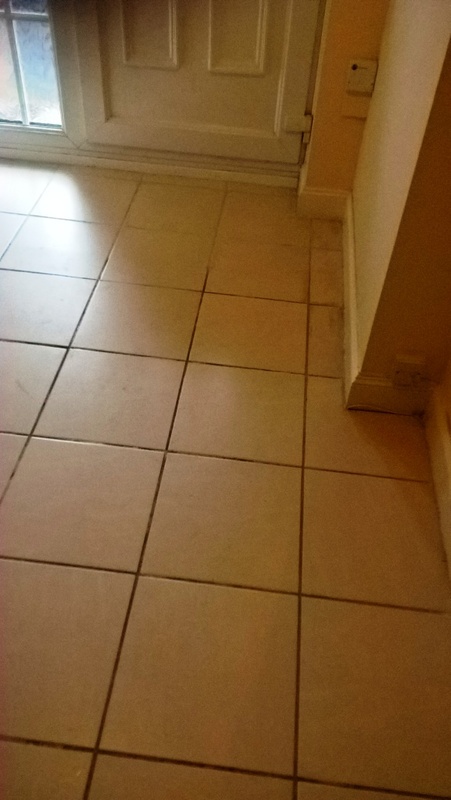 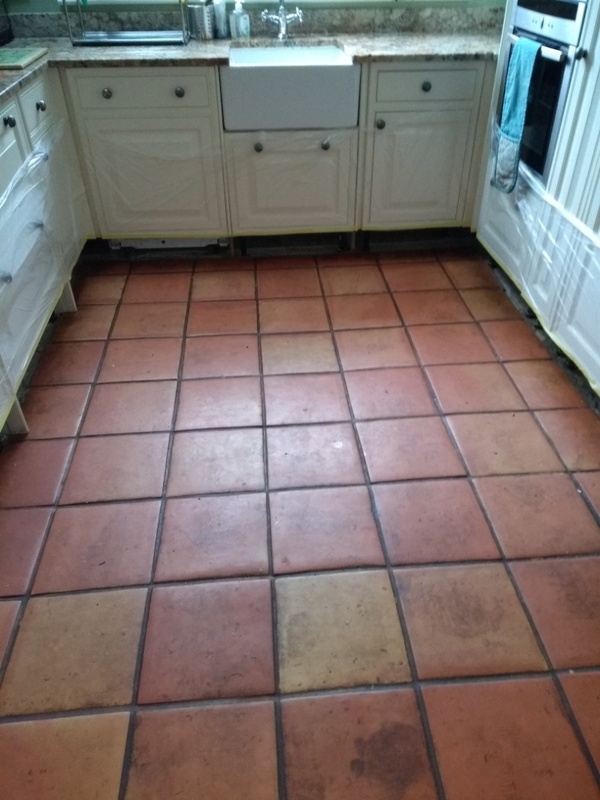 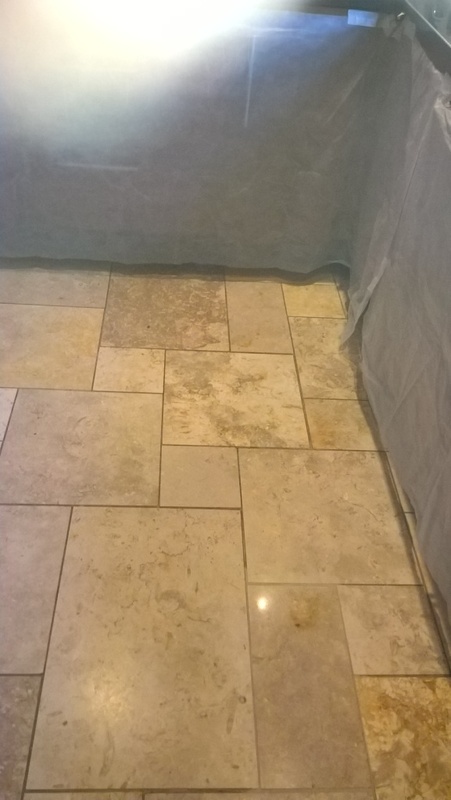 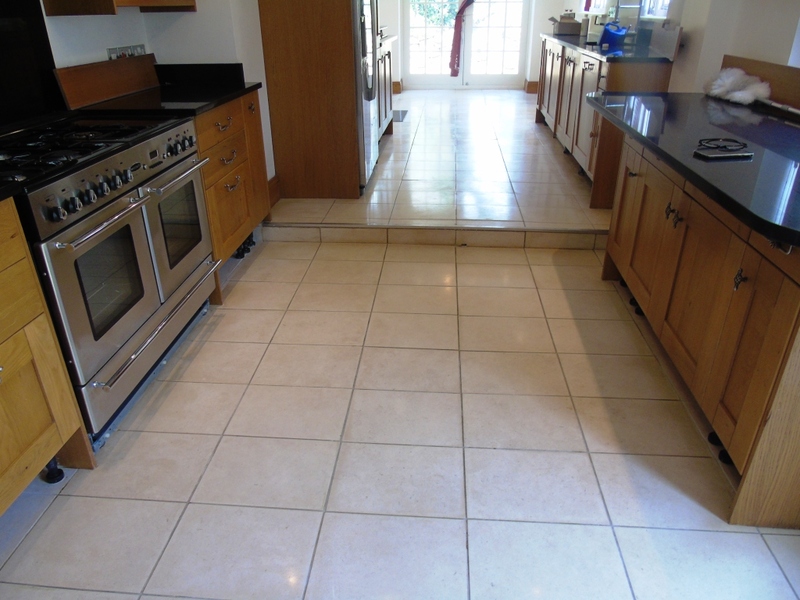 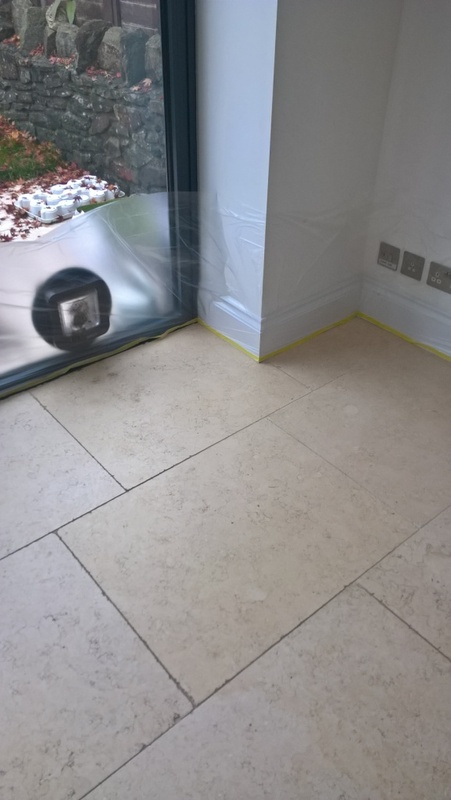 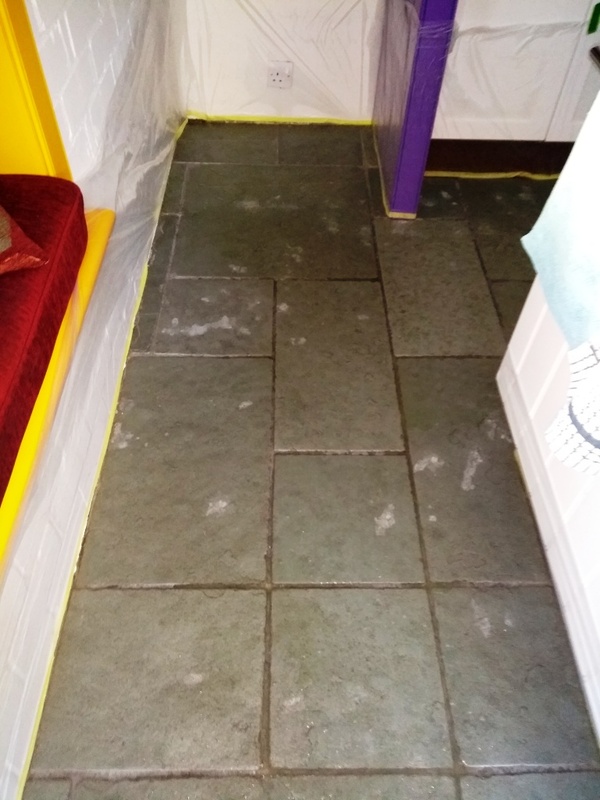 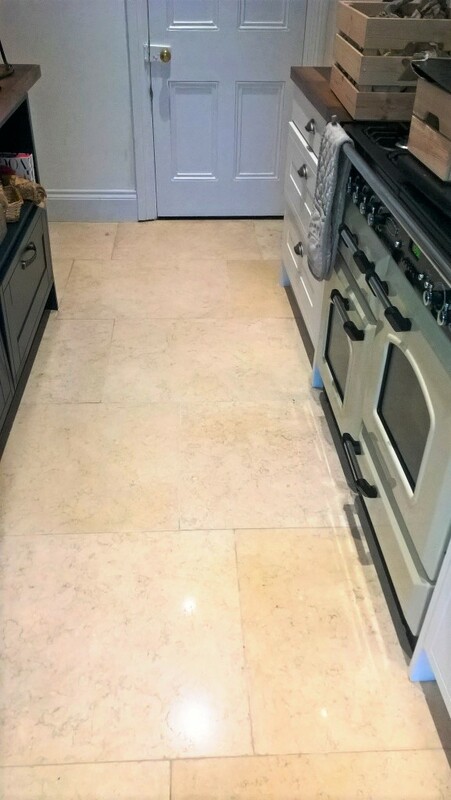 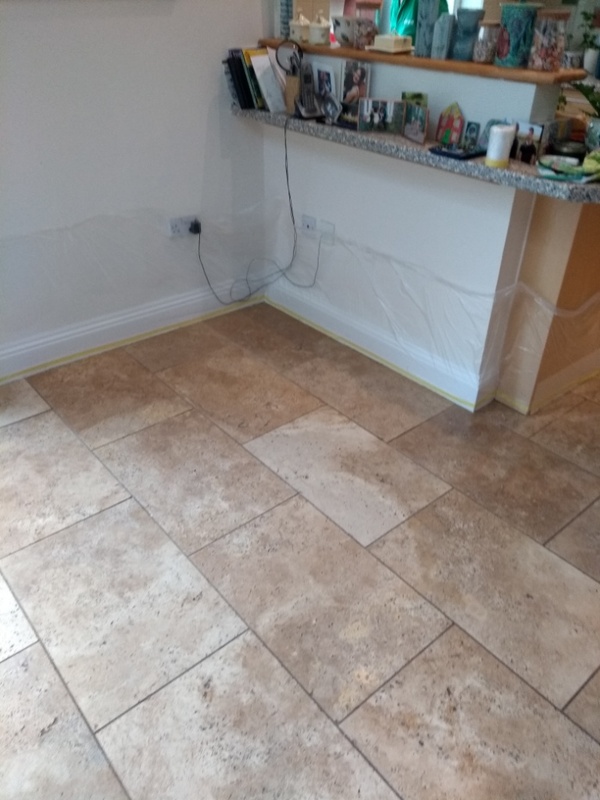 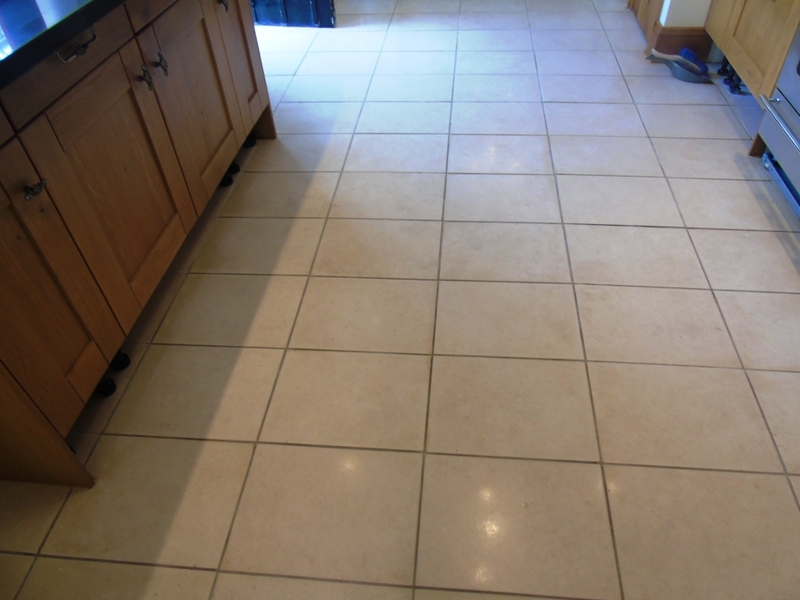 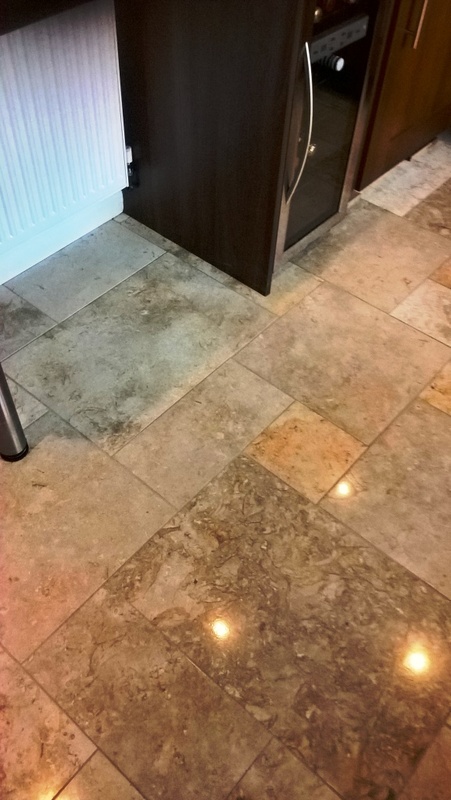 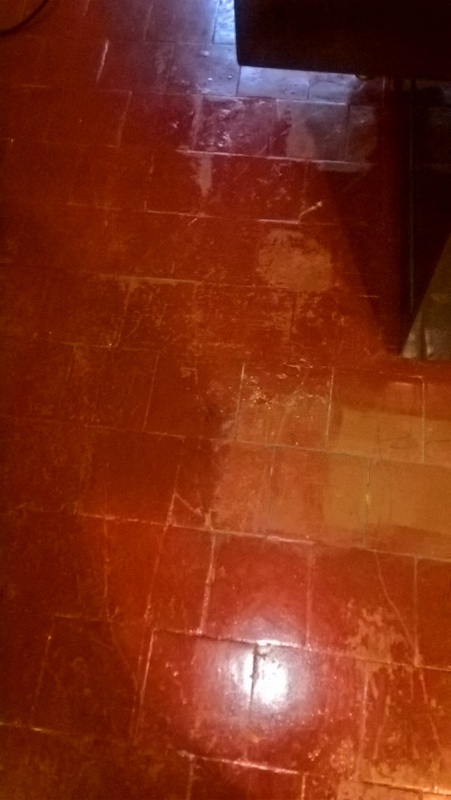 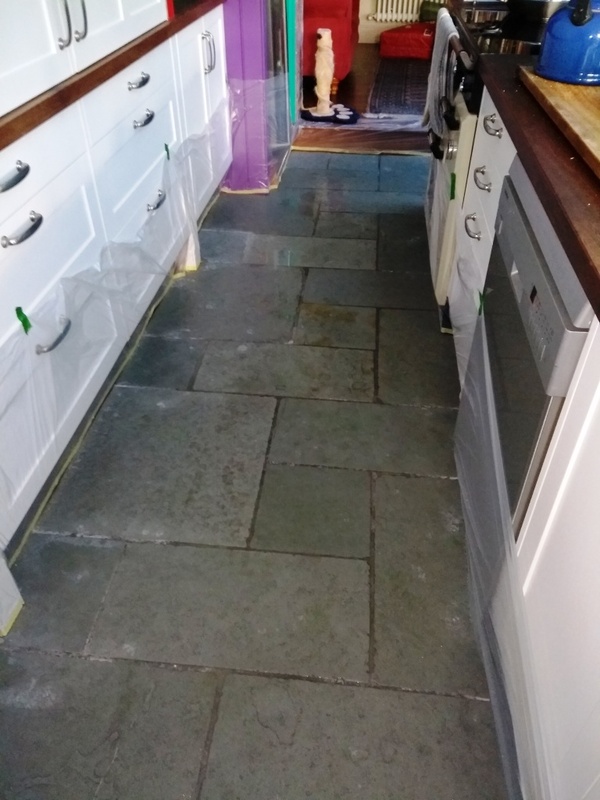 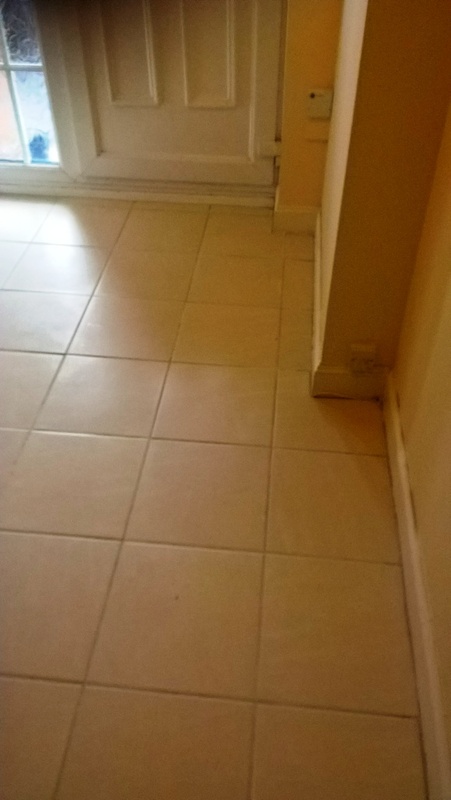 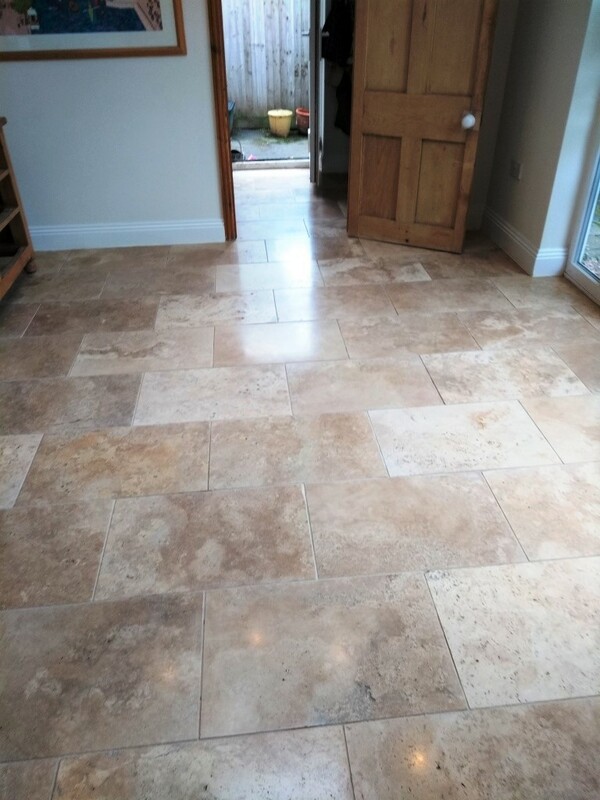 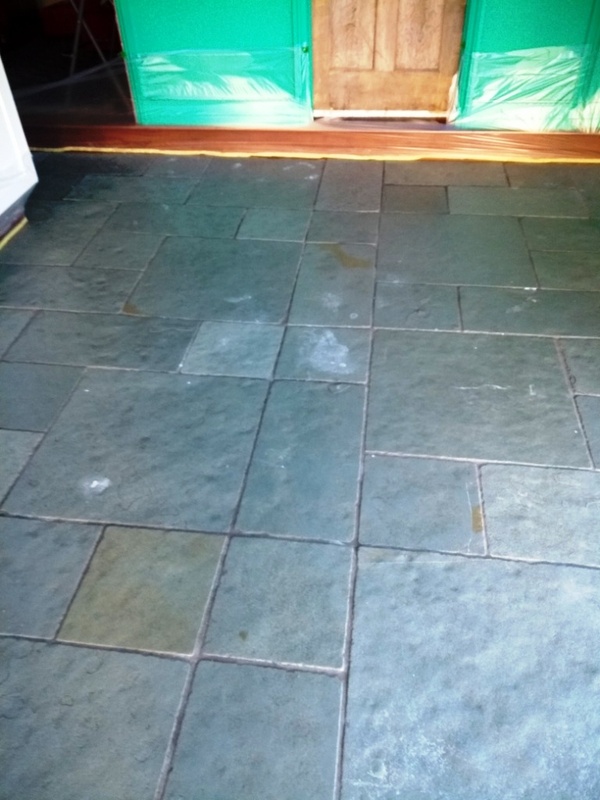 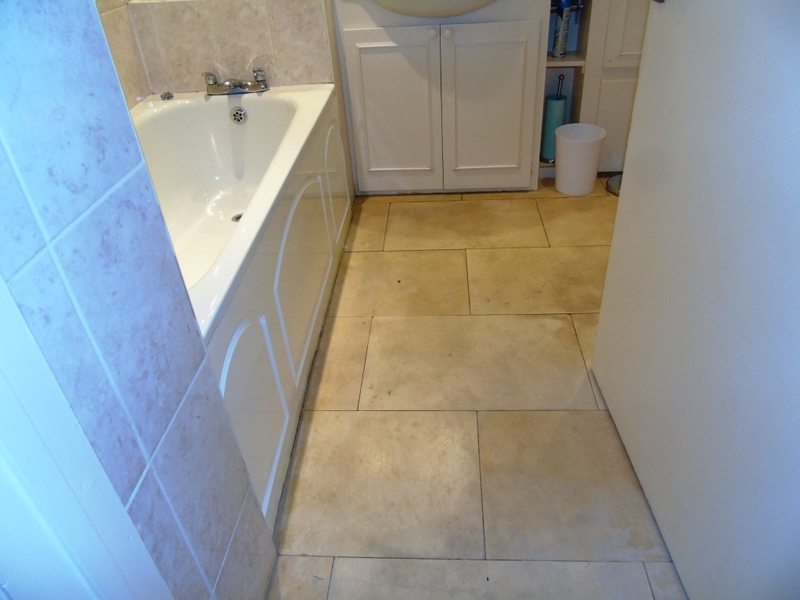 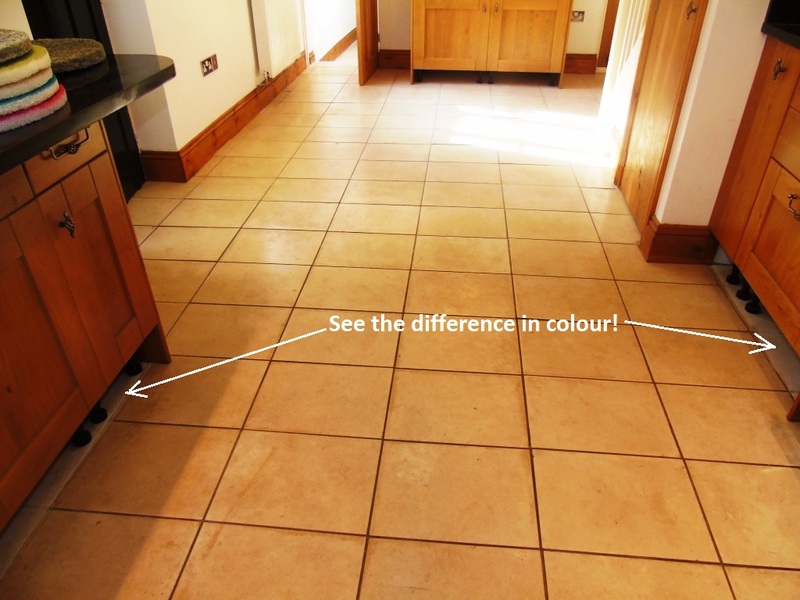 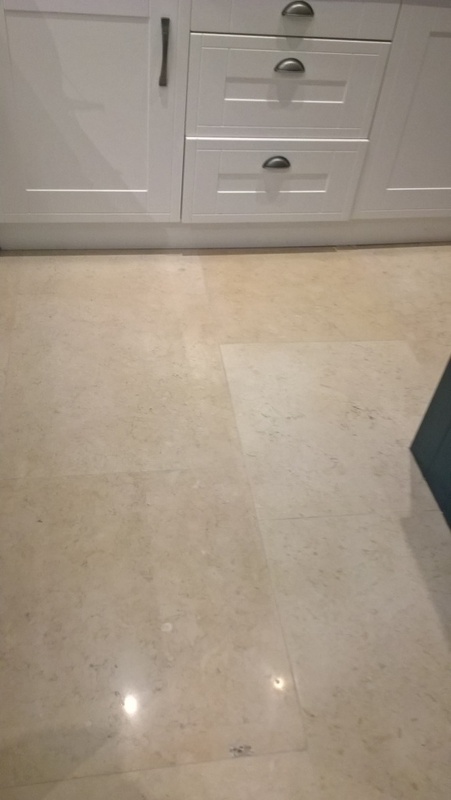 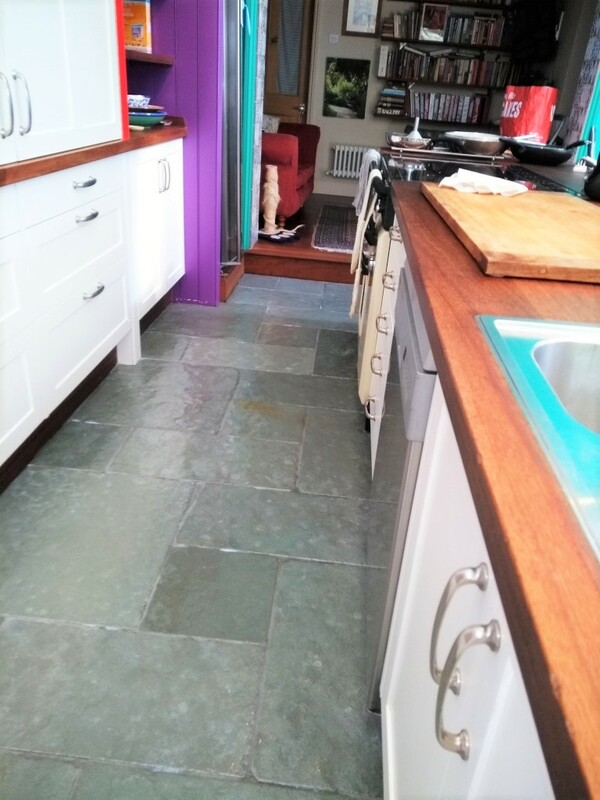 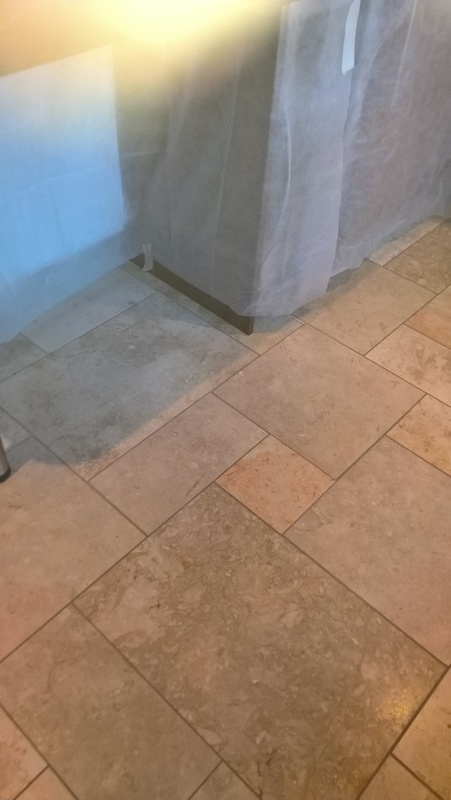 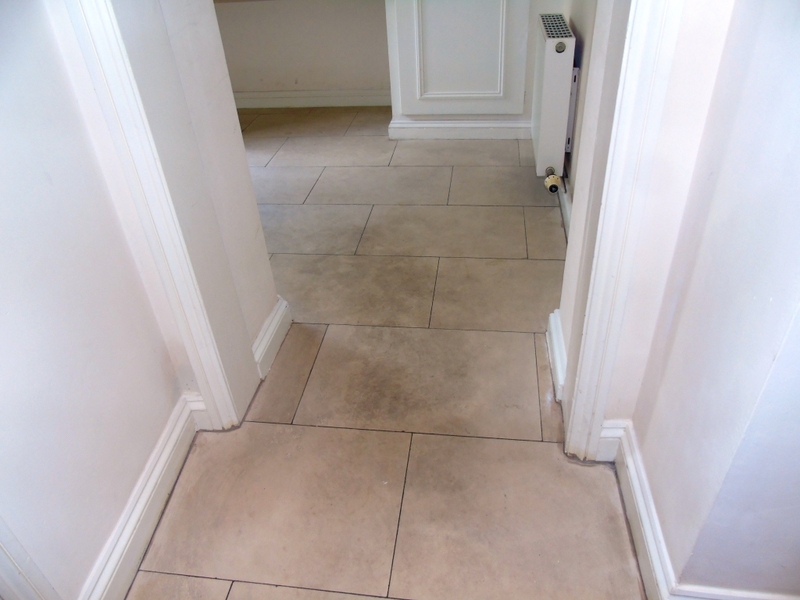 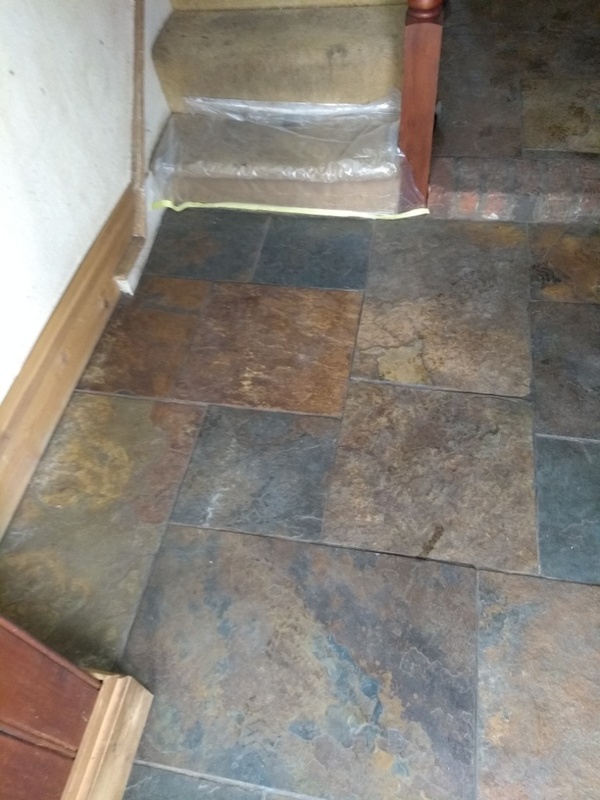 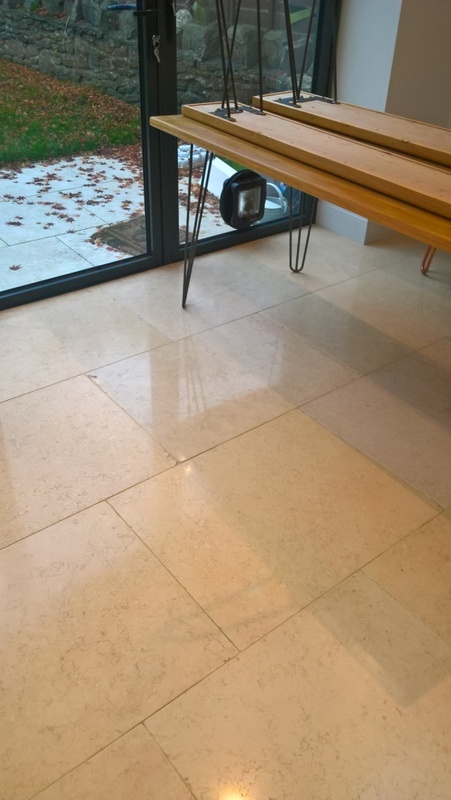 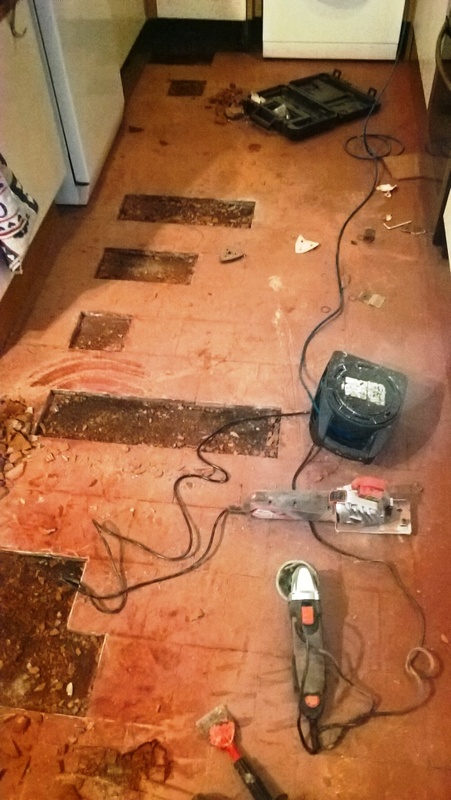 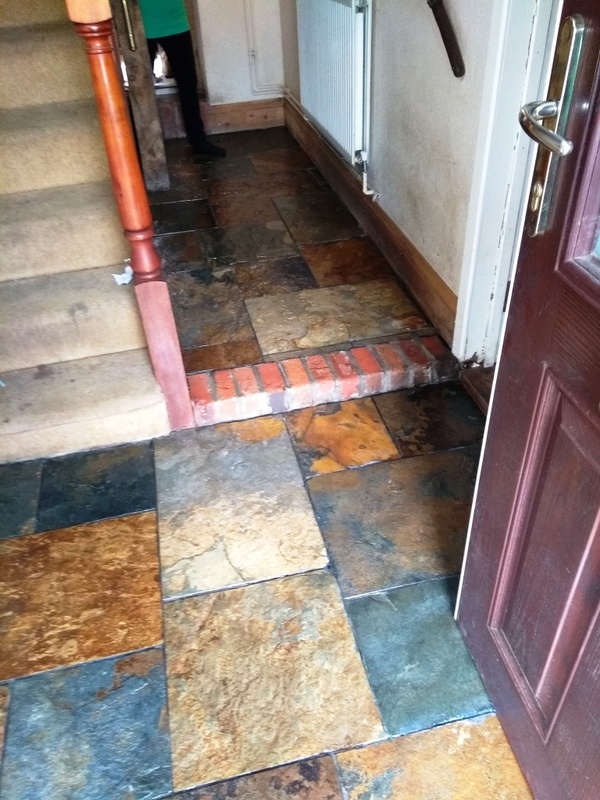 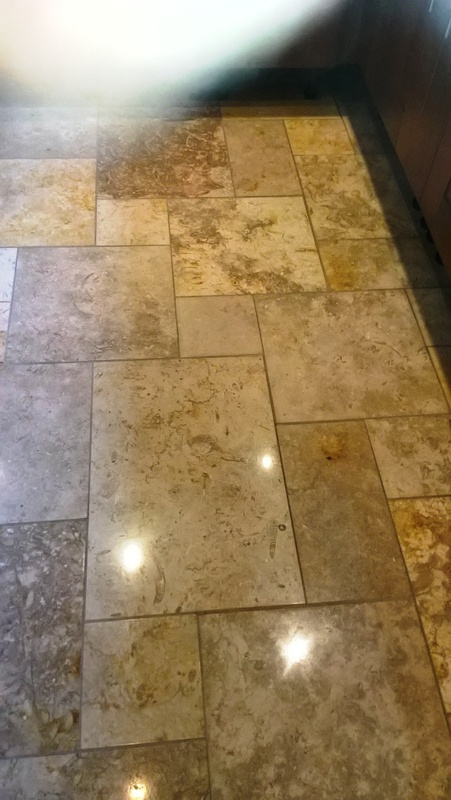 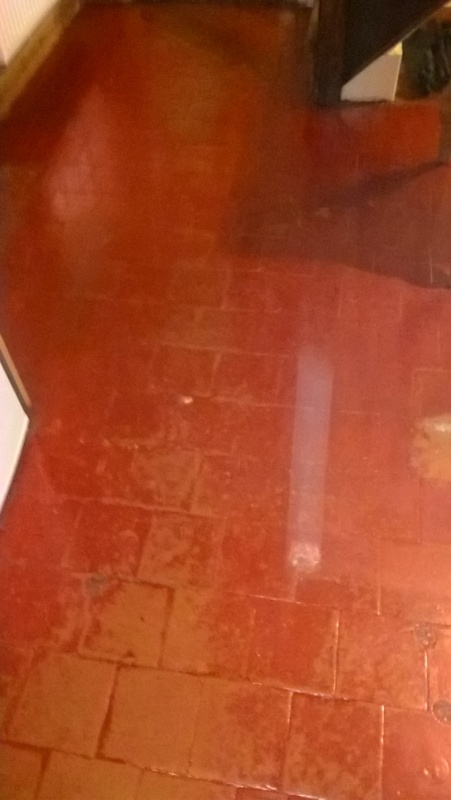 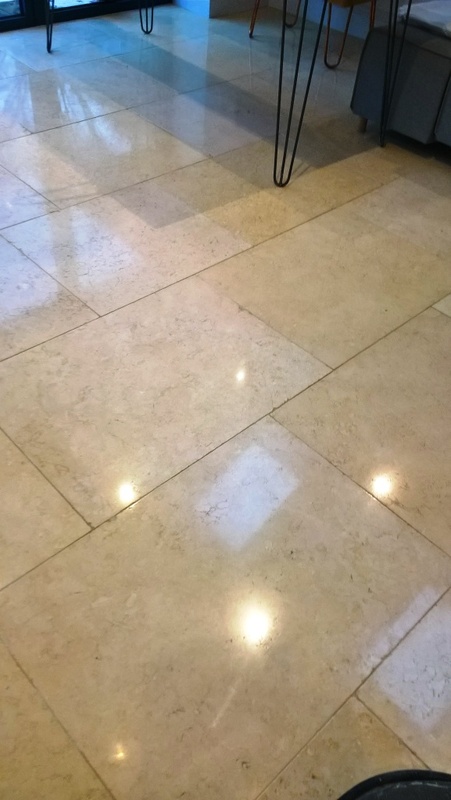 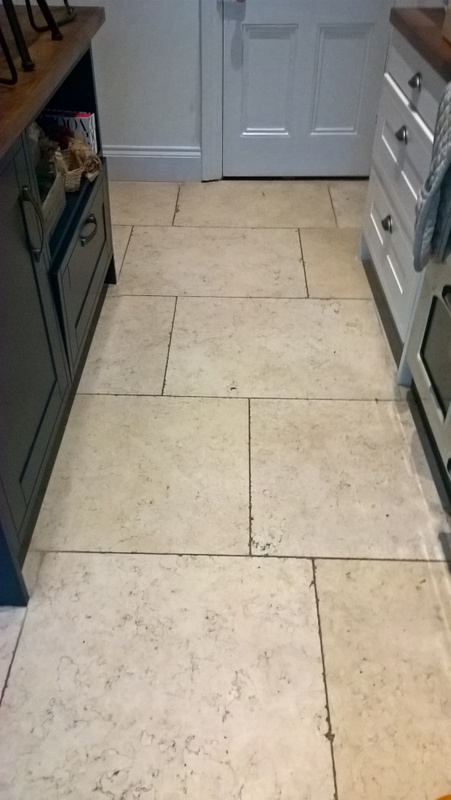 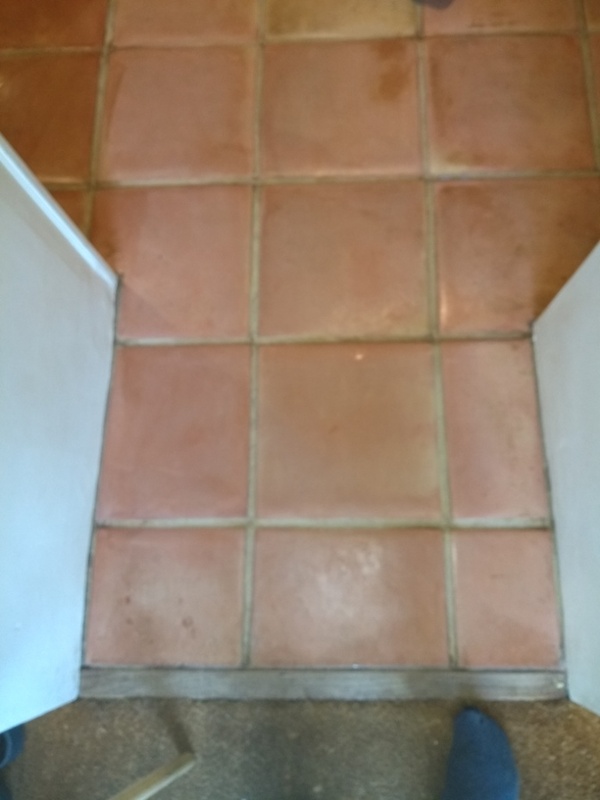 This customer from Cirencester was not happy with her look of her Travertine floor tiles; in fact, she had been browsing the Tile Doctor web site and realised how her floor should look and got in touch to have it renovated. 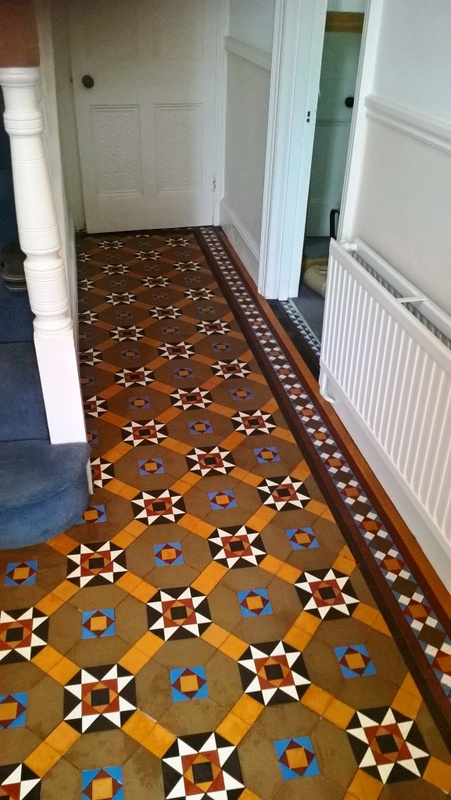 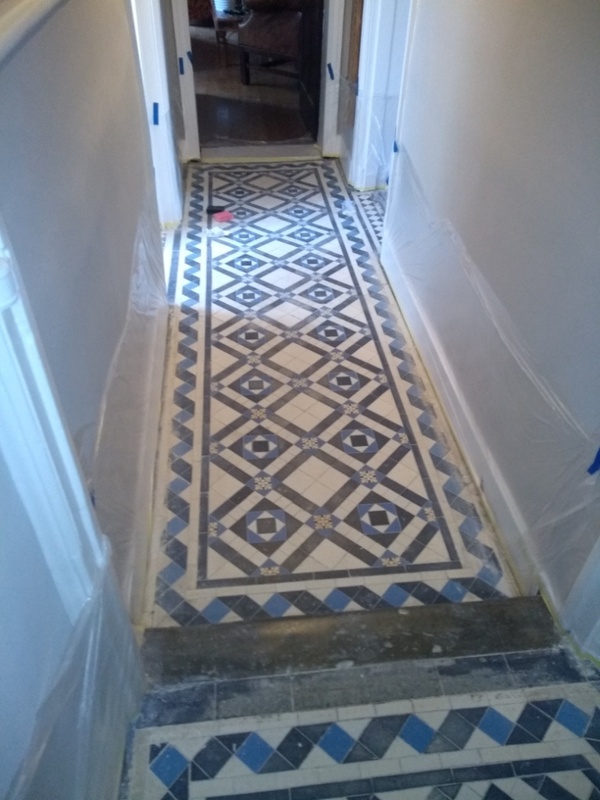 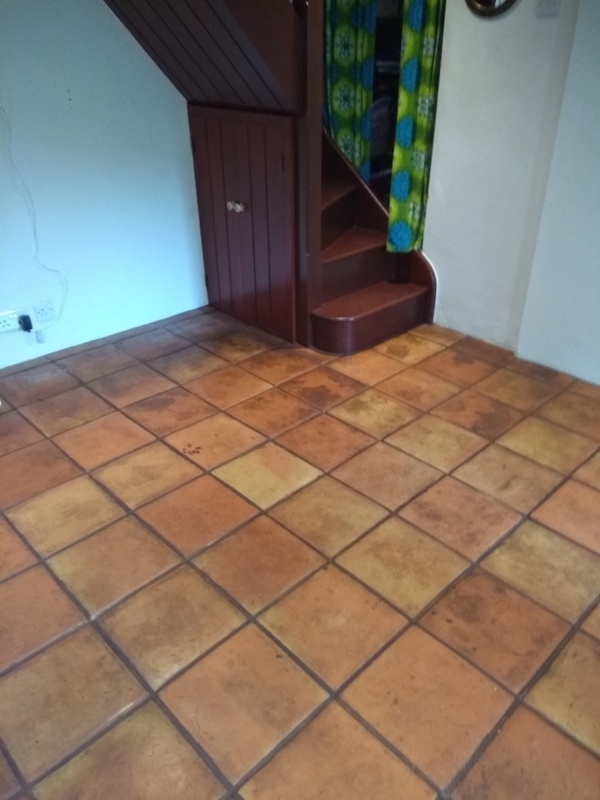 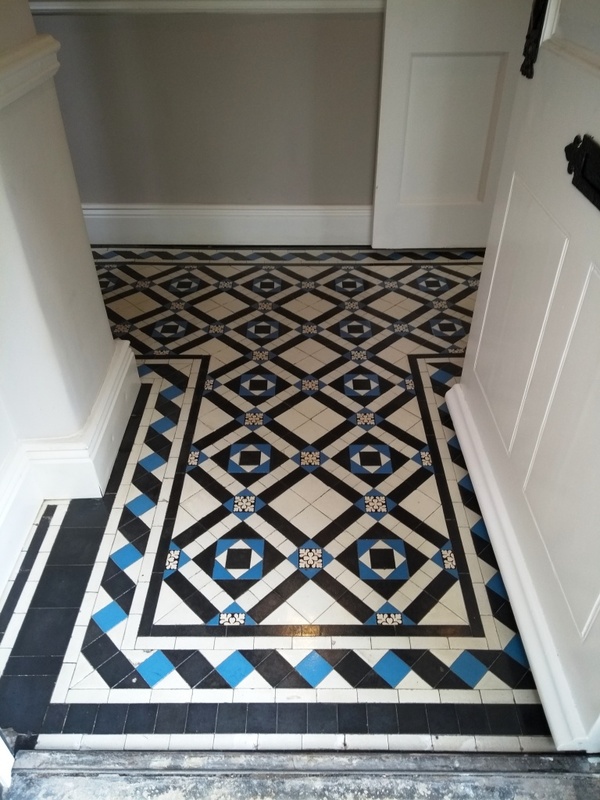 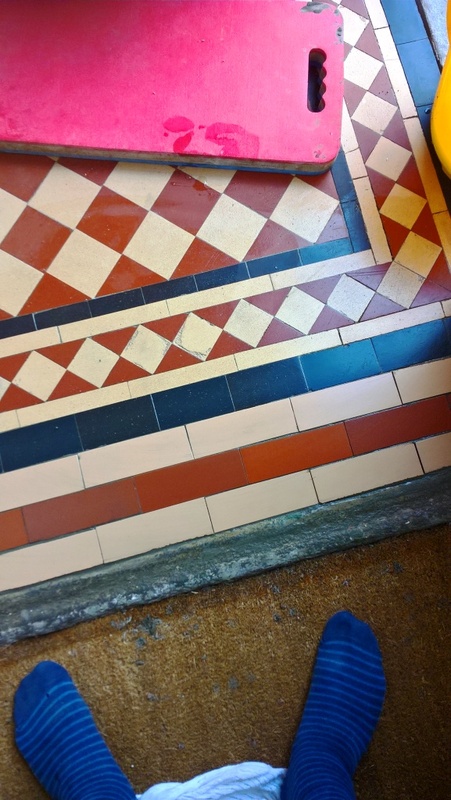 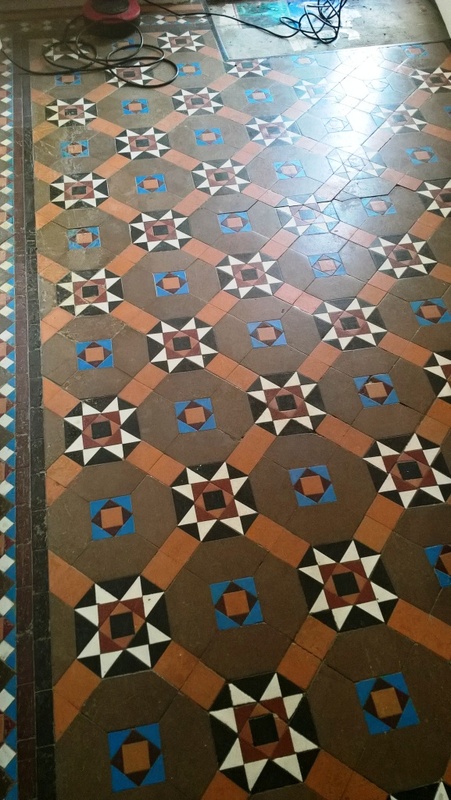 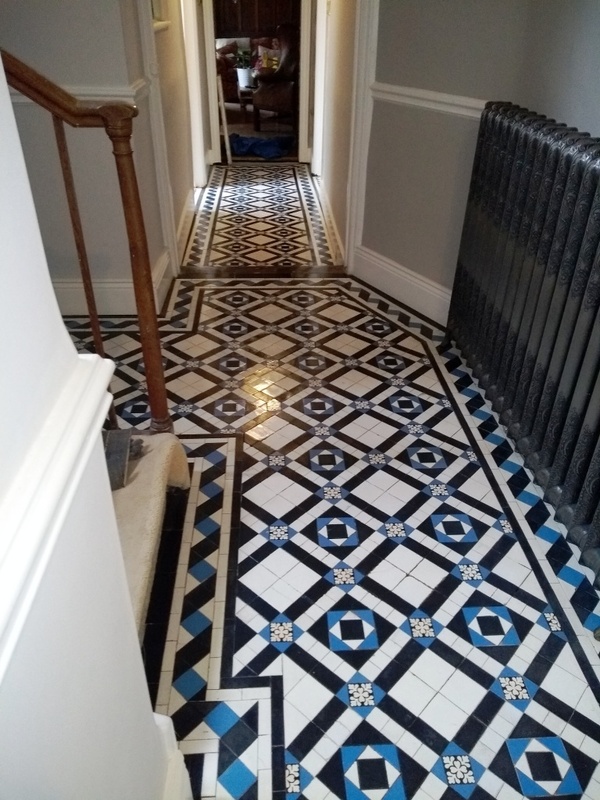 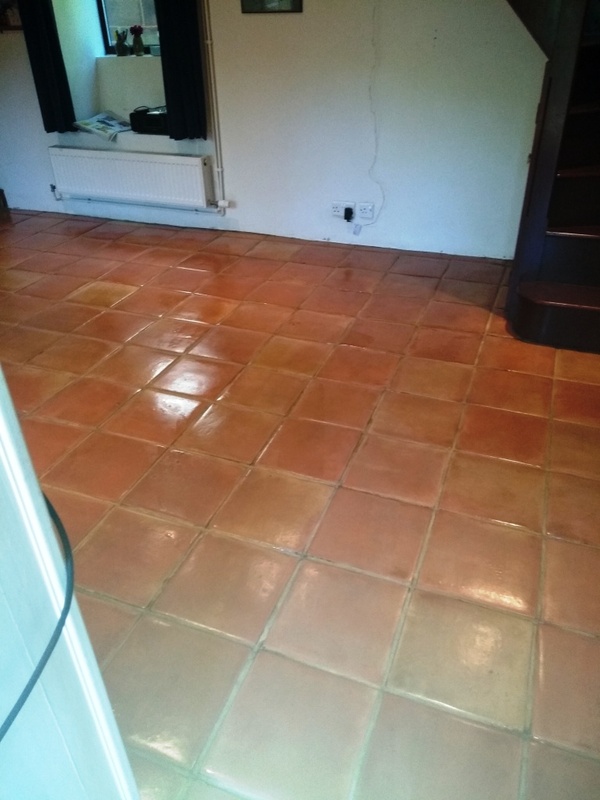 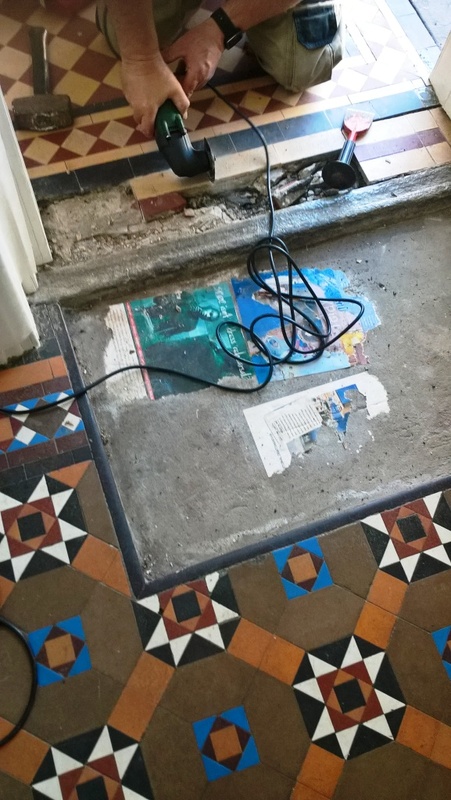 I’m based in Dursley which is West Gloucestershire and have made the journey to Cirencester to the East on several occasions to work on tiled floors there. 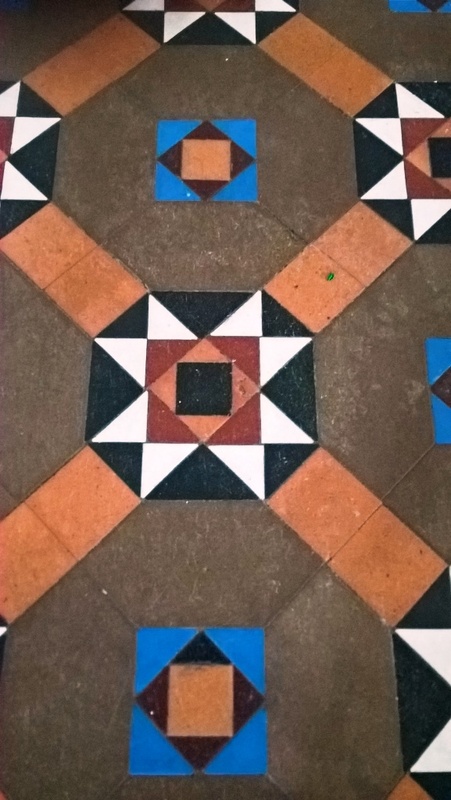 If you have never been it’s worth a visit; it’s a lovely market town which dates back to Roman times and is situated on the lower slopes of the Cotswold Hills. 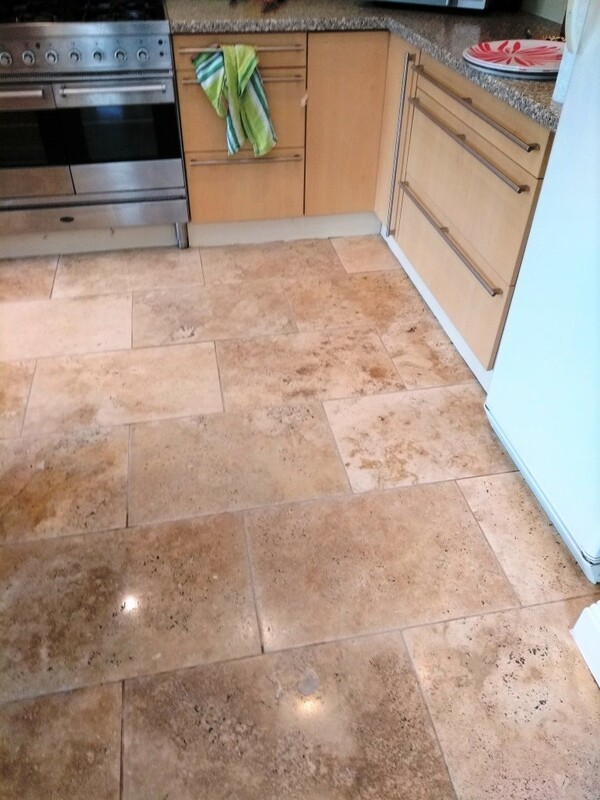 To get the best from Travertine it really needs to be burnished which is an abrasive cleaning process that involves the application of several different grades of diamond encrusted pad to the stone lubricated with a small amount of water. 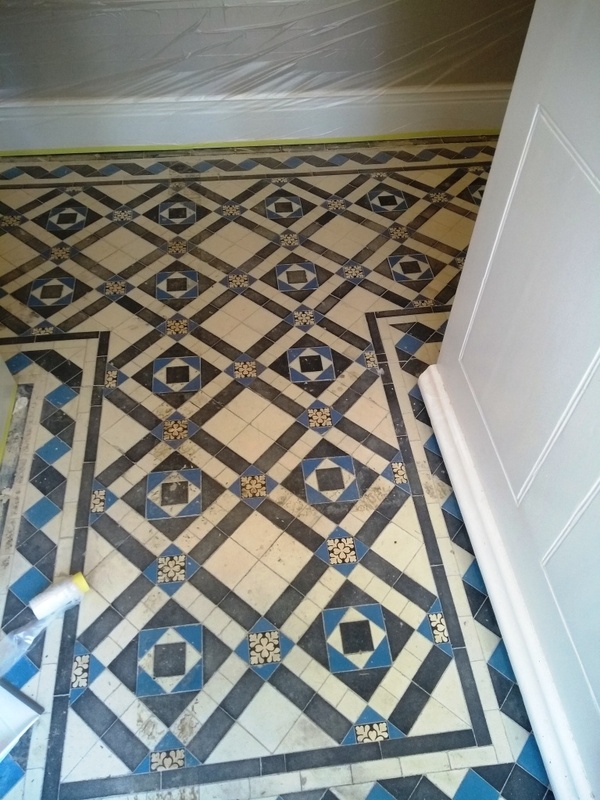 The pads are fitted to a rotary buffer and run over each tile in sequence from coarse to very fine. 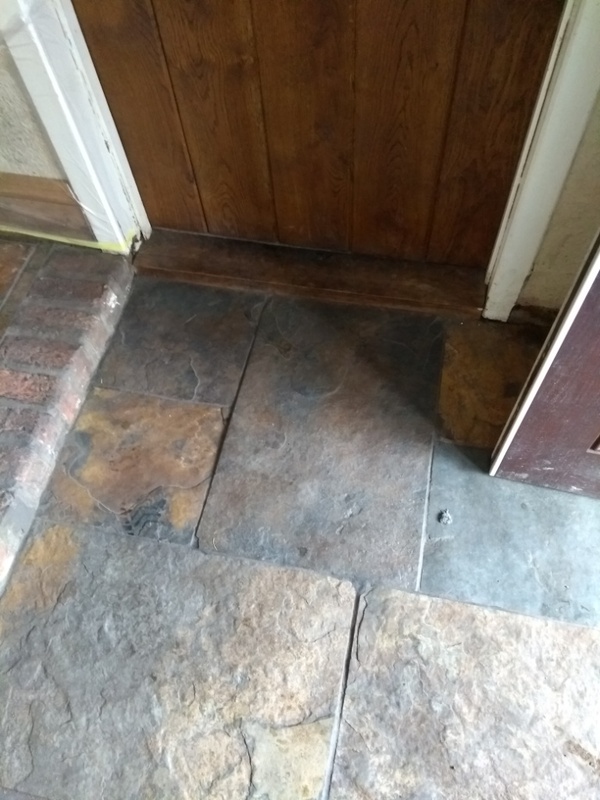 I started with the first of the four burnishing pads which is a coarse 400 grit pad that designed to grind away the dirt and old sealer on the surface of the floor. 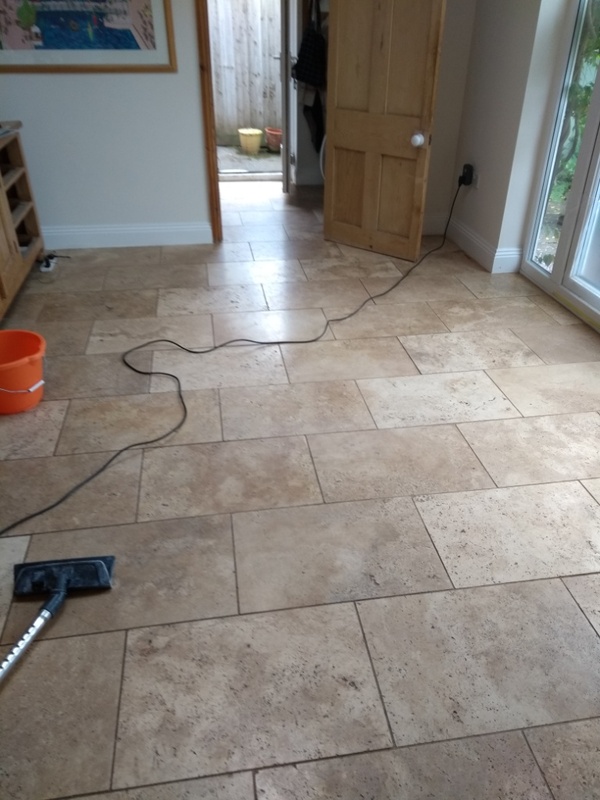 After applying the first pad, I moved my way through the medium 800 and fine 1500 grit pads to gradually restore the appearance of the Travertine making sure to rinse the floor with water in between to remove the soiling. 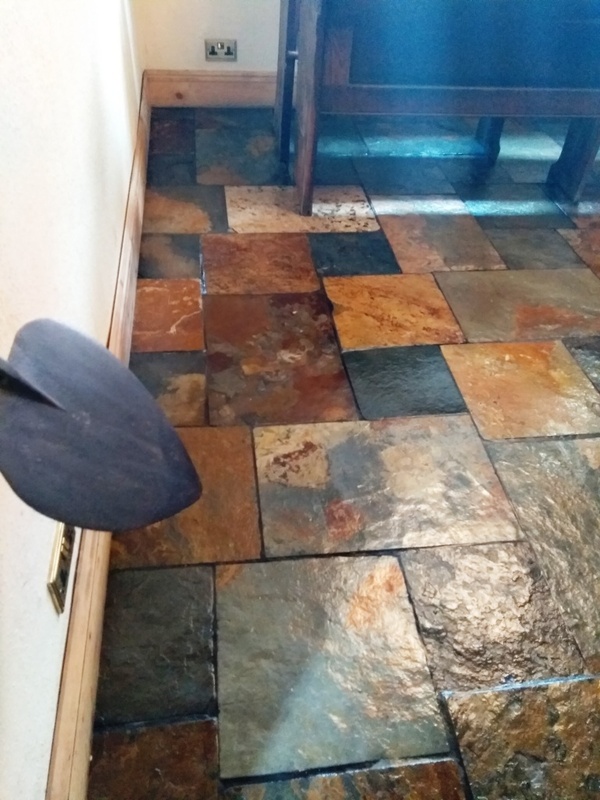 Next, I set about cleaning grout lines with Tile Doctor Remove and Go which was diluted with water and then scrubbed in with a stiff narrow brush. 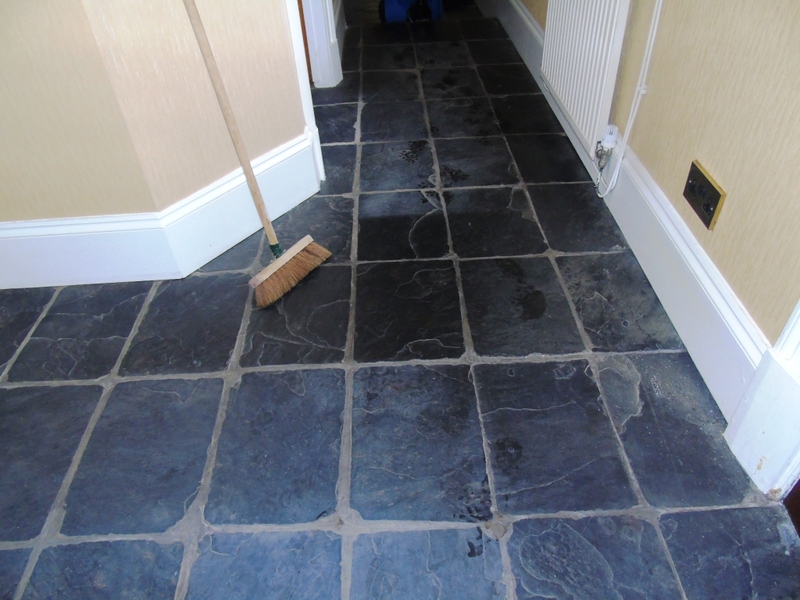 The soiled cleaning solution was then rinsed off with more water and extracted using a wet vacuum. 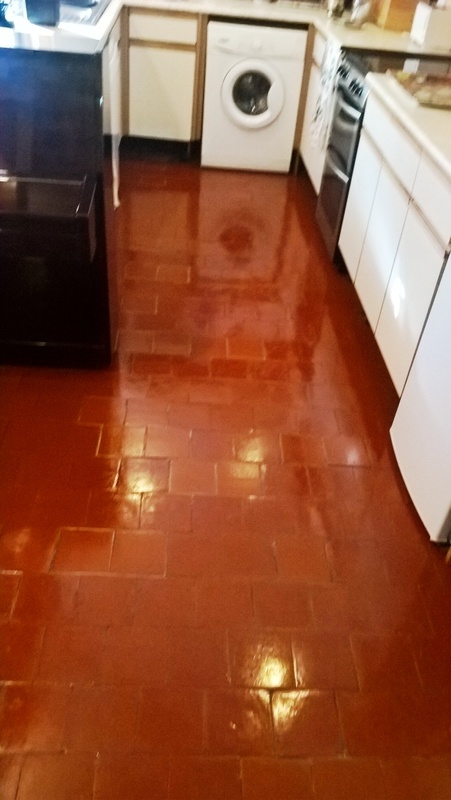 The burnishing and grout cleaning took most of the day and I need the floor to be dry in order to seal it so I left for the day and left the floor to dry off fully overnight. 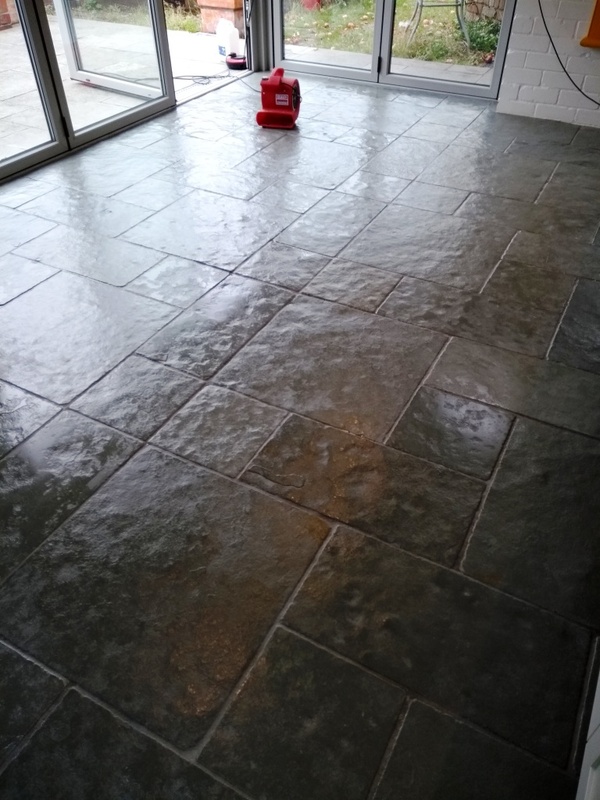 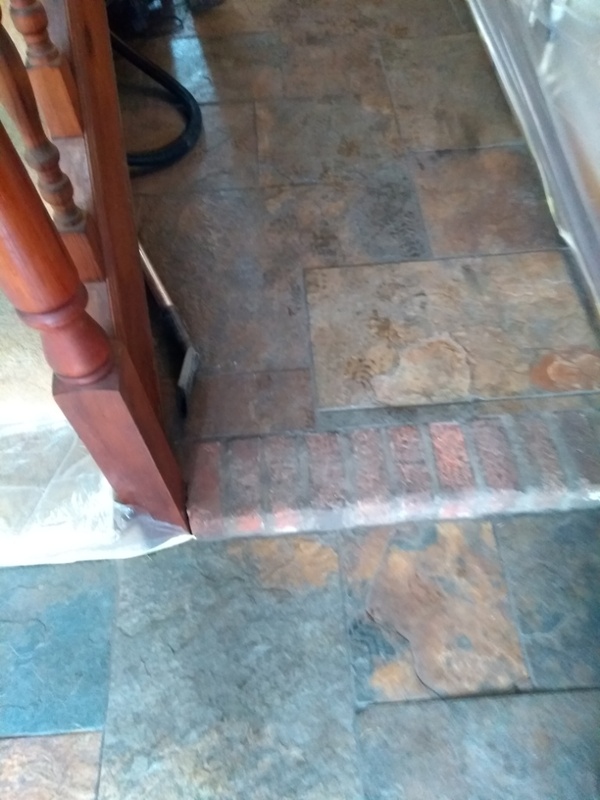 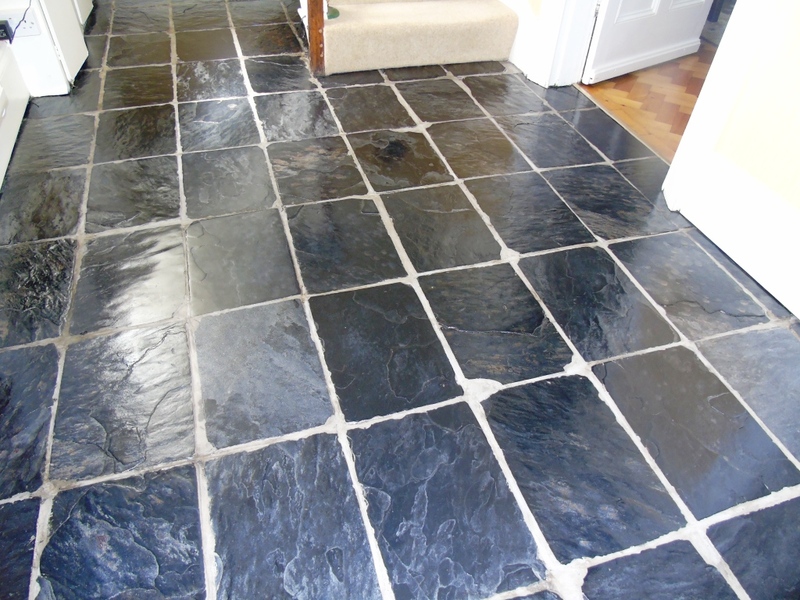 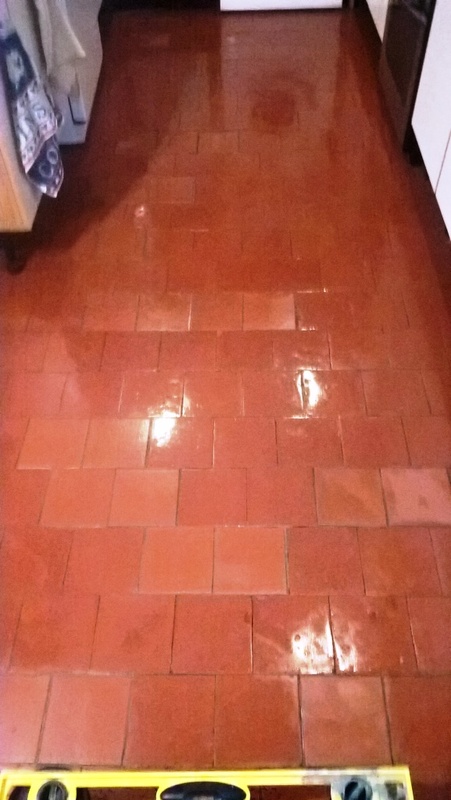 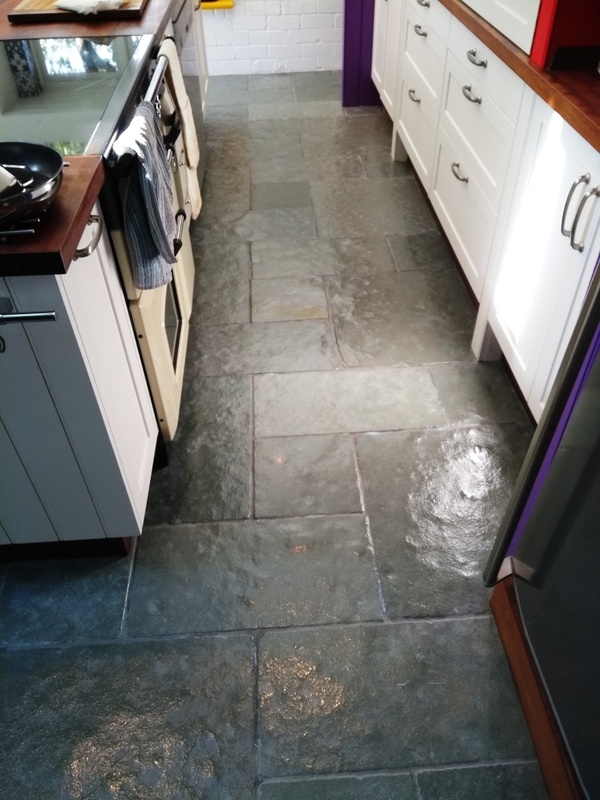 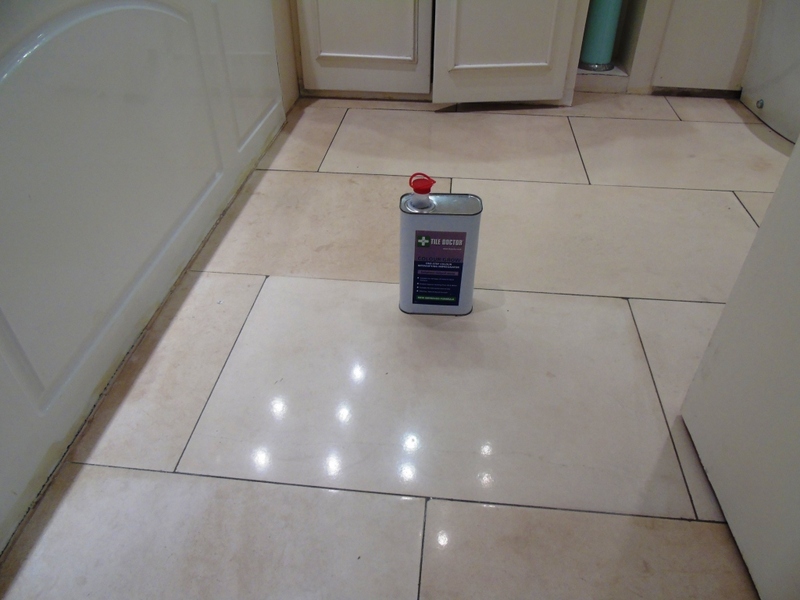 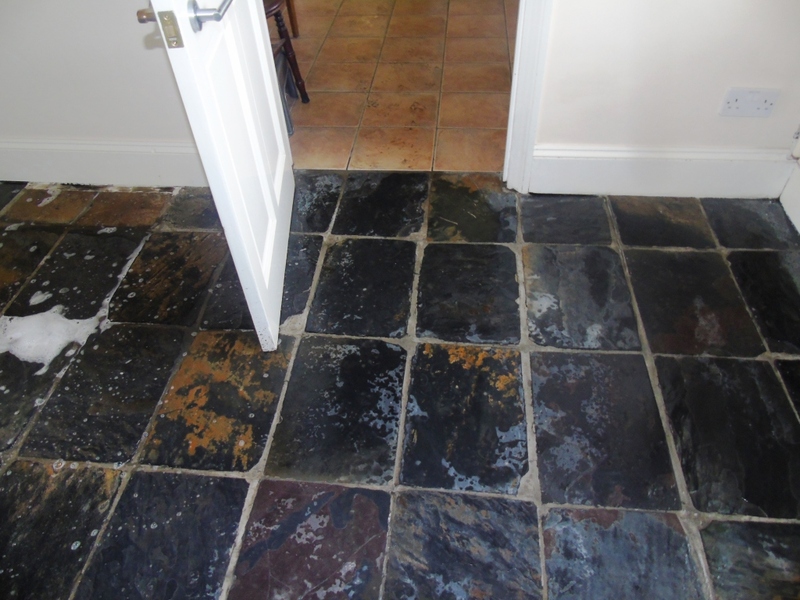 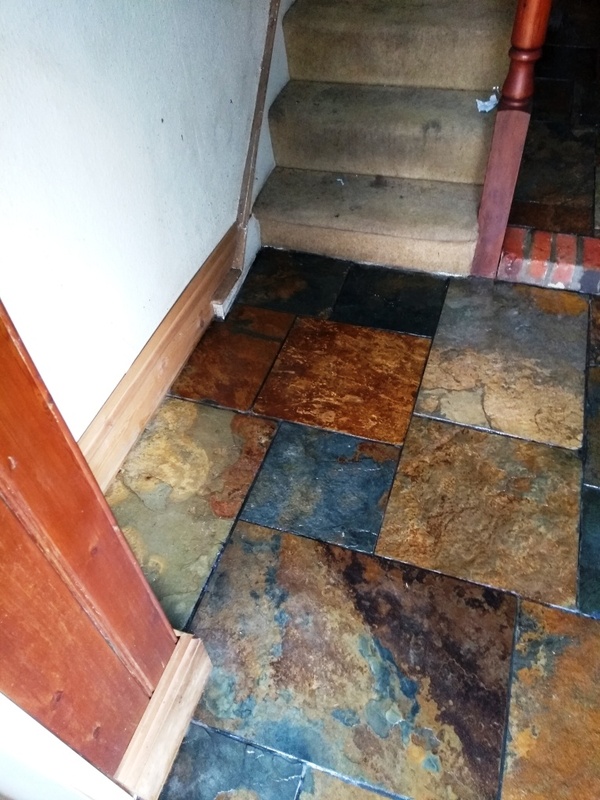 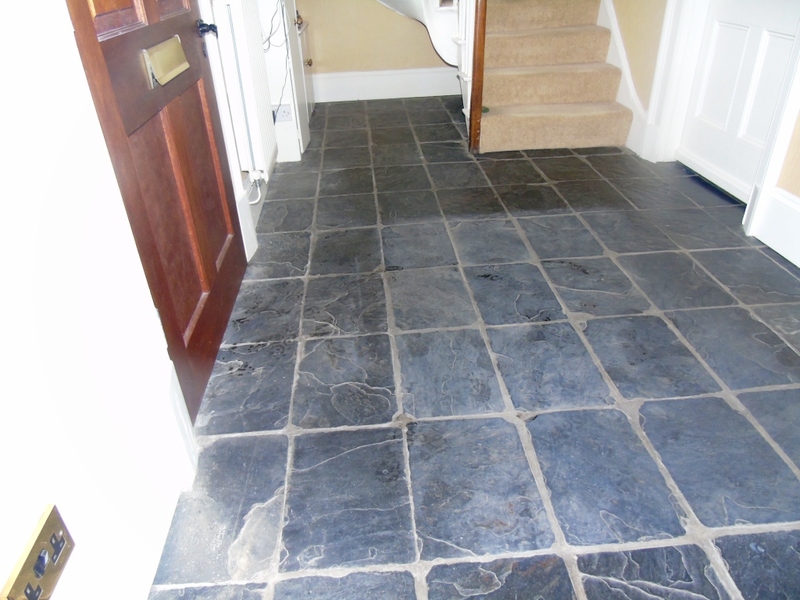 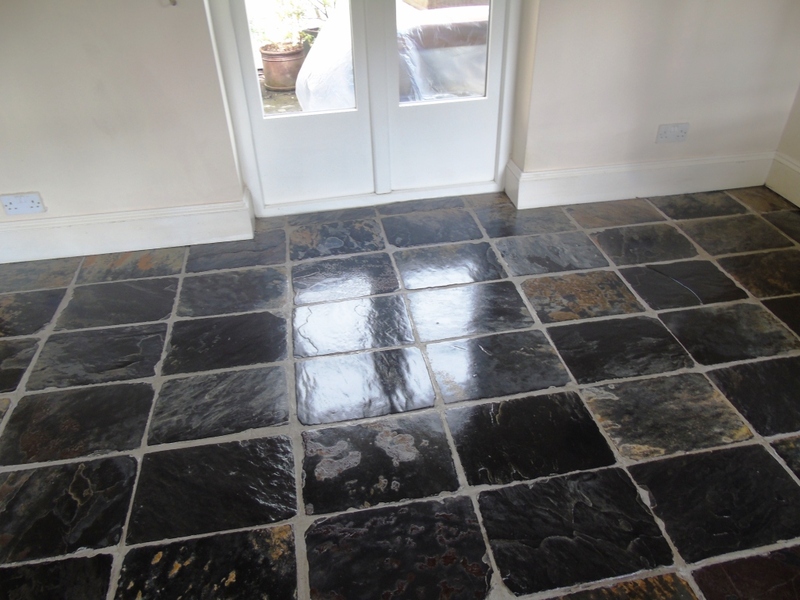 Once I was happy with polish I proceeded to seal the floor using Tile Doctor Ultra Seal which is a natural look sealer the seeps into the pores of the stone protecting it from within but without affecting the look of the stone. 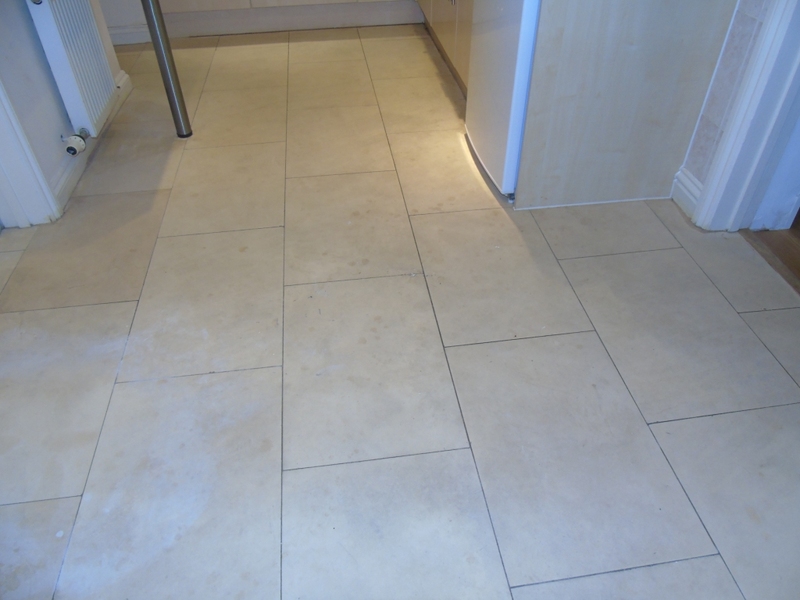 The floor was then left to dry for an hour and I finished by giving the Travertine a final buff using a white pad. 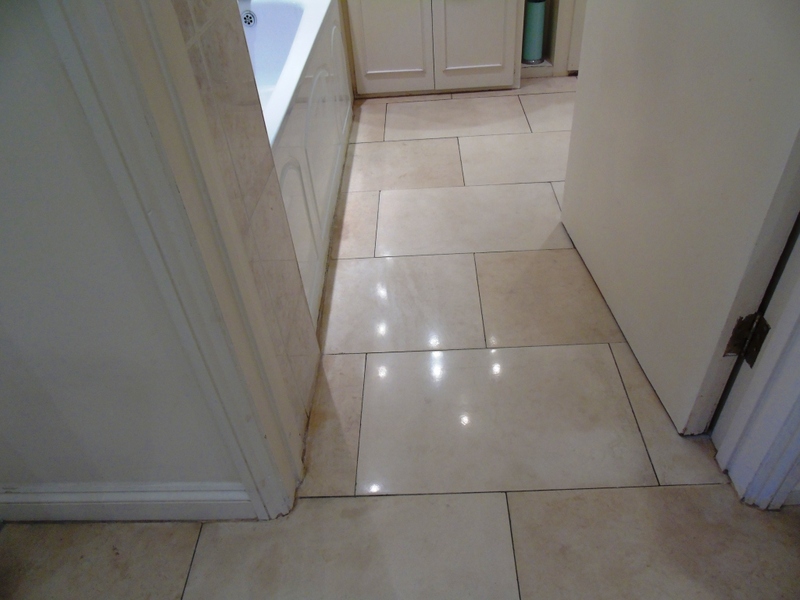 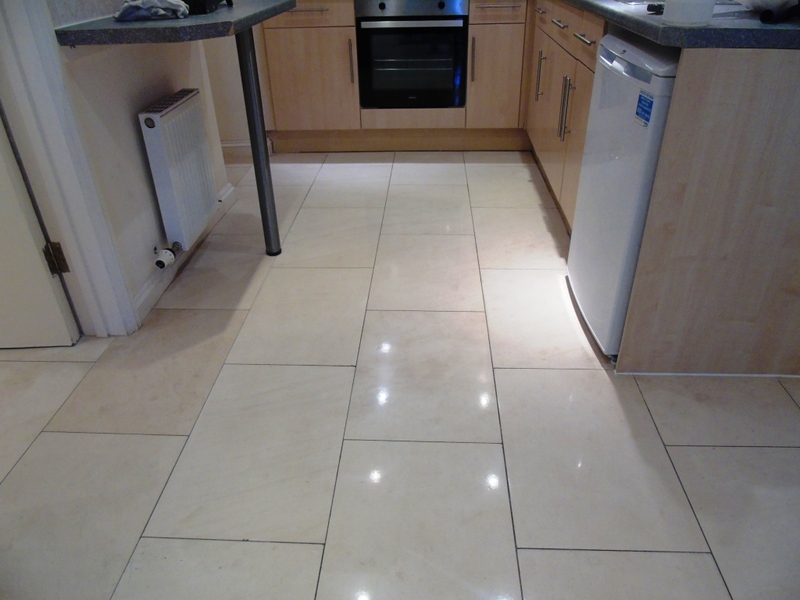 My customer was delighted and now she has a Travertine tiled floor looking how it should.